A chance to experience author Amanda Foreman and hear her thoughts on the characters. While I have seen a youtube version of an interview with Ms. Foreman, the interview on the “The Duchess” DVD, with readings of Georgiana’s original letters, is more interesting and to the point. A few moments to hear Ralph Fiennes explain the thinking process behind his brilliant portrayal of the Duke of Devonshire. A chance to experience Keira Knightley, when she was not in character as Georgiana, which helped me to appreciate her performance. A chance to experience scenes from the movie, and commentary on the movie, without critics taking pot-shots at Keira Knightley’s performance. I was very impressed with Ms. Knightley’s portrayal of Georgiana. It must be difficult to make a character come to life among all the pomp of wigs, and costumes, and fancy sets. The movie opens with Georgiana as an innocent 17-year-old, and ends with Georgiana as a forty-something-year-old wife and mother. Ms. Knightley is to be commended for being believable in all these variations on a character. A chance to hear Ralph Fiennes (who the critics have shown more faith in) explain and praise Keira Knightley’s performance. An understanding and respect for the work of the director, Saul Dibb. More great images of the wonderful costumes, and, a discussion of the background and symbolism of the costuming. More great images of the set. And, the information that Chatsworth, where much of the movie was filmed, was the same location used for the 2005 Jane Austen movie “Pride and Prejudice”. Aha! Another reason that viewers experience similarities between the two movies (also, the fact that Keira Knightley appeared in both.). The Chatsworth connection is also the reason that “The Duchess” videographers did lots of tight shots on the scenery. I believe that anytime someone wears a wig, there is always the desire to see the wig exposed. Maybe it is partly just so your brain can witness and confirm the fact that it really is a wig? While the movie provides one chance for this visual, the DVD shows the lovely Keira Knightley actually adjusting her wig. And, Ms. Knightley also explains how difficult it was to wear the wigs. So, there was some resolution of the wig dissonance. It may have been too much to ask, though, I wish that the DVD could have told the whole rest of the story, and restored all the characters gone missing between the book and the movie. Georgiana’s sister, Harriet Spencer Ponsonby Bessborough is not mentioned in the movie or the DVD. Harriet was close to her sister and joined her sister in Georgiana’s time of exile from England and the Duke. Also missing is the anti-Georgiana sentiment of the Duke’s family (some of them hoping to inherit the Devonshire title and riches for themselves) and some very interesting portraits of the other society women of the day. Because Ralph Fiennes’ performance in “The Duchess” was so brilliant, it would have been worthwhile to listen to him speak about it for hours. Though, the short taste given on the DVD is valuable. Curiously, Fiennes focuses his comments so much on the fact that the Duke was a man of his time, one wonders, briefly, if Fiennes entirely forgives the Duke for his sexism and cruelty. The part I am perhaps most frustrated about is that Fiennes made the Duke as interesting a character as Georgiana. Though, again, Fiennes’ portrayal is so profound, words could not adequately describe it, and, there can be no genuine critique of such a performance. I am a very political person, and I am a feminist. So, for me, I wanted someone to say: Georgiana was a feminist, in a time and place where women were so oppressed and caricatured, that feminism just would not fly. I wanted the author, or the female actors, or someone to say the word feminism, and to make some bold, feminist statement about what could be learned from Georgiana’s struggle. Do I think that happened? The word feminist is never used in the DVD. Though, there are so many feminist ideas, and such a defense of Georgiana’s struggle as a woman in a patriarchal society, that a feminist could feel inspired and appeased. One of the voice-overs says, “She finds a way to…regain some kind of power in a time when really, women had very little.” In addition, the comments of Historical Advisor Hannah Grieg provide interesting and meaty commentary on the politics of the story, and Georgiana’s importance as a political figure. In the book, Amanda Foreman explains the feminist issue and struggle of women more thoroughly. The book speaks about how the expectations of society, and patriarchal religious thinking stifled, or at least haunted, Georgiana. My impression is that Amanda Foreman herself is not a classical feminist. Yet, Ms. Foreman’s careful and detailed telling of Georgiana’s story reveals the struggle of women in the 18th century. 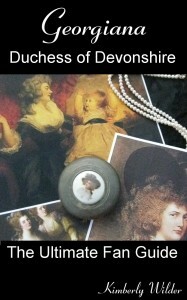 The movie “The Duchess” is to be commended for bringing to life such a worthwhile subject, and for doing so with the framework of such an excellent piece of literature. The movie does an excellent job of bringing one of the most compelling plot lines of the book to life. And, the DVD adds a few more layers of history and perspective to the mix. It is definitely worth owning and exploring. Somehow Ralph Fiennes’s comments on the DVD sent me tumbling backwards in my understanding of the Duke, or maybe in my understanding that Fiennes’ understands the Duke in the same way I do. Book:Many chances to growl at him. In the book, it is easier to dislike the Duke, because you experience the chronological order of his philandering. Also, his family is revealed as another dark character exploiting Georgiana. Still, there are times in the book when you see how needy he is for love. The movie presents such a vibrant, believable, and sympathetic portrayal, the viewer is able to relate to the Duke almost fondly. Though, there are scenes where his actions are appalling. The DVD is interesting in allowing Ralph Fiennes to describe his performance and motivation. Though, in some ways, Fiennes’ words only add to the mystery. DVD:More chances to growl, again. Bess was clearly a very manipulative person. And, all forms of the story reveal that. Though, the writing in the movie, and the portrayal by Hayley Atwell allow for much empathy towards Bess. Book:A+, many details of her hypocrisy and greed. Though, redeemed in later years. Movie: A+, In many ways, the mother is the villain of the movie “The Duchess”. On the DVD, off set and out of character, is where everyone had a wonderful chance to say the word “feminism”, and it is a little disappointing that nobody does. Of course, one would expect that the book would have far more chance for detail than the movie. And, the movie does include the politics, and does allude to Georgiana’s power and influence. Though, the focus of the movie is clearly on her personal life. The DVD uses the chance to insert more praise for Georgiana as a political being. I felt it was remiss that neither the movie nor the DVD refered to Georgiana’s relationship (almost definitely friendship and not intimate) to the then Prince of Wales. And, I wonder if that was a decision based on modern politicals. DVD:B+, (Rating given because it leaves one wanting more, more, more historical context. Though, again, what is given is edifying and worth seeking out the DVD for. Book:A+, Five Stars. Must read. Movie:A+, Five Stars. Must see. Though, not for the reasons you may expect. DVD:A, Four and a half stars. Must own. And, then seek out even more Georgiana material. Am not sure if you can help me or not, although with your extensive knowledge of Georgiana am sure you can! I am trying to look for a print of the picture of Georgiana as Diana flying through the clouds, and wondered if you had come across it at all? I enjoyed your excellent comments on the film/book, I also feel that a lot was missing from the film although I enjoyed it all the same, even if Keira Knightley played her which upset me a little!